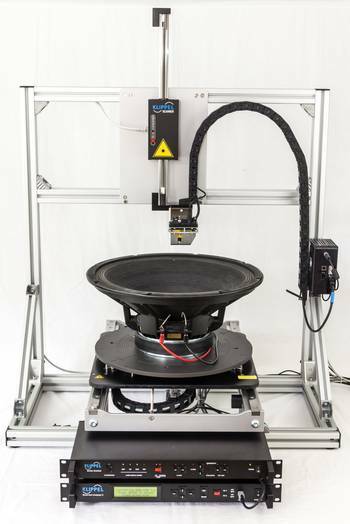 The SCN Vibrometer measures the vibration and geometry of radiators, enclosures and mechanical structures used in loudspeakers, micro-speakers, headphones and other electro-acoustical or electro-mechanical transducers. The SCN Analysis Software performs visualization, animation and a modal analysis of the mechanical vibration using the scanned data which is provided by the vibrometer. The sound pressure output at any point in the half-space sound field and the polar radiation characteristic are predicted by using mechanical data. Novel decomposition techniques show radial and circular modes and vibration components related to the SPL output. It is the target of the analysis to provide a better understanding of the interaction between vibration and radiation. At 6kHz there is a significant dip in the on-axis sound pressure response. The inner and outer cone region vibrate in phase opposition and the resulting volume flows cancel each other out. The reason is a good bending moment propagation between the inner and outer cone due to the stiff honeycomb membrane, which leads to this distinct vibration mode. It is recommended to use coating spray for transparent and shiny diaphragms. More information. The figure above illustrates the vibration and radiation analysis based on distributed mechanical loudspeaker parameters measured by laser scanning to select the optimal transducer and to perform loudspeaker diagnostics. 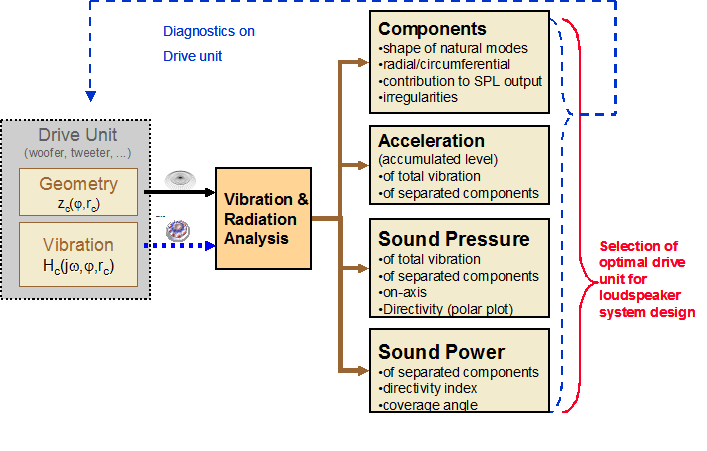 Paper: "Distributed Mechanical Parameters of Loudspeaker"
Application Note 31:"Cone Vibration and Radiation Diagnostics"
Application Note 32:"Effective Radiation Area"
Application Note 30:"Scanning Rectangular Speakers"
Application Note 55: "FEA_BEA Interface for SCN"
Application Note 66: "FEA2SCN Interpolation for SCN"
Application Note 68: "Importing Polytec data into SCN"